© Laura Porter, licensed to About.com, Inc. The Tea Terrace is on the top floor of an Oxford Street department store yet feels like a delightfully quirky English tea room. In a city that adores coffee these days, it's lovely to find a tea room that's modern and serves a great choice of the nation's favorite beverage. The Tea Terrace is an all-day restaurant open all week and there is an extensive gluten-free lunch menu too. You may choose to visit for afternoon tea as the specialty here is delicious buttery scones. Days and Times: Afternoon tea is served daily, check the website for current hours. Dress Code: No dress code. The Tea Terrace restaurant is next to the children's clothing department so is popular with families. The first thought upon seeing the restaurant was "Alice in Wonderland" with the bright chairs and quirky touches such as the teaspoon light shades. This a modern take on something traditional so there are bright pink and blue high-back Queen Anne style chairs and sofas. The seating is vinyl so it can be warm on a sunny day. The Tea Terrace uses china by Royal Albert due to its quintessential English design – the country garden and the national flower, the rose. All of the Royal Albert products used at The Tea Terrace are available to purchase either from The Tea Terrace or the Royal Albert Department on the 4th floor. Its beautiful floral design felt very elegant and just right for the setting. The tea choice is comprehensive and this is quality whole leaf tea although it is served in tea bags rather than loose in the pot. As each pot gives you 3 or 4 cups the upside to having a tea bag is that it can be removed to stop the tea stewing and every cup can taste as good as the first. Tregothnan teas are the only teas produced in England – from the Tregothnan Botanical Gardens near Truro in Cornwall. The Tea Terrace has chosen a range of caffeine-free herbal teas for the health benefits as well as the flavors. The other teas are made by an award-winning company, and what I tasted was superb. We arrived at the 'wait to be seated' sign and were met with a smile from a helpful member of staff. All the staff we met were great at their job: friendly, courteous, polite and efficient. You could choose to have just tea and a slice of homemade cake from the Cake Counter, or a choice of scones but there is also a Traditional Afternoon Tea and a Celebration Afternoon Tea on offer. 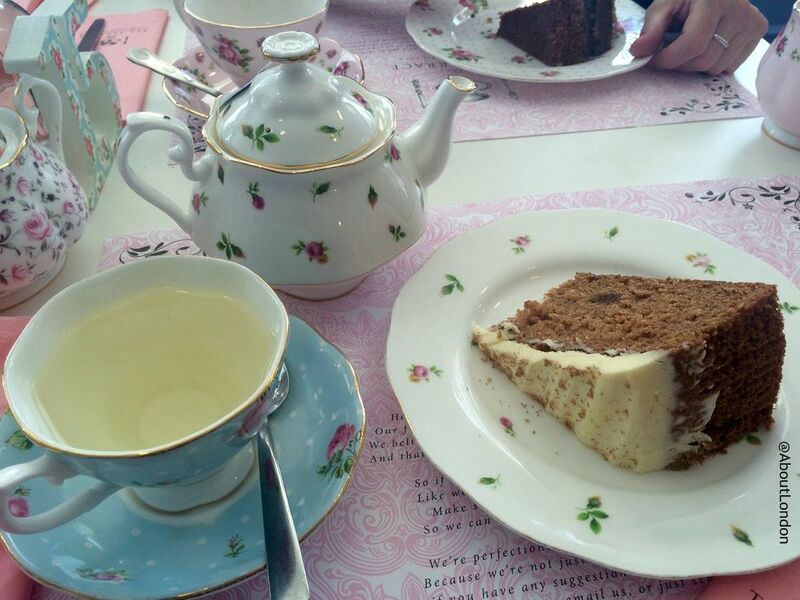 Do note, the Traditional Afternoon Tea includes a slice of cake along with the sandwiches, scones, and tea. The Celebration Afternoon Tea has a glass of Prosecco and lemon drizzle cake included (as well as the sandwiches, scones, and tea). When you place your afternoon tea order there is lots of personalization so be ready to make some decisions. First, you choose two sandwich fillings each with an option for white or brown bread. Then you choose from the scone menu and there's a lot more than just plain or fruit. You get two scones each and I chose an apple and cinnamon scone as well as a fruit scone for general comparison. And then there is your tea choice. With so many Tregothnan caffeine-free herbal options I chose the Manuka tea which was just right for a sweet meal. We were offered soup as a starter, which was unusual, but we declined knowing how filling a meal afternoon can be. Service was quick and we received individual teapots and a shared three-tier cake stand. The triangle sandwiches had plenty of filling, but the scones really stood out for being excellent making me want to return to try other varieties on the menu. I don't know where else I could choose from six varieties of scone in London. I think I'll go for the Cranberry and White Chocolate Scones next time. We did get the Celebration Afternoon Tea so I had a lovely slice of lemon drizzle cake but I couldn't resist a trip to the Cake Counter as the homemade cakes by the slice and cupcakes looked amazing. I visited with a friend and saw many families enjoying afternoon tea. As this is a restaurant other diners were enjoying lunch or just a coffee and time to relax from hectic shopping. I think The Tea Terrace afternoon tea options are well priced and a high quality. I think the venue may well become most popular with families and I hope to bring my daughter to try scones here soon. Interested in more tea places in London? Check out some of the best options, including places that your kids will love too. A Spot of Tea at the Kensington Hotel, Anyone?